In our Victorian Life school workshops children will learn about the way of life of Victorians who lived in the South East. Our Museum is home to many original Victorian buildings. As the children step inside these spaces they can honestly say they are stepping back in time. Children and young people who visit us are able to walk through a Victorian toll house, visit Victorian farm buildings, compare the kitchen in the home of a farm labourer with the kitchen of a wealthier family and hear the organ playing inside our Victorian tin chapel. 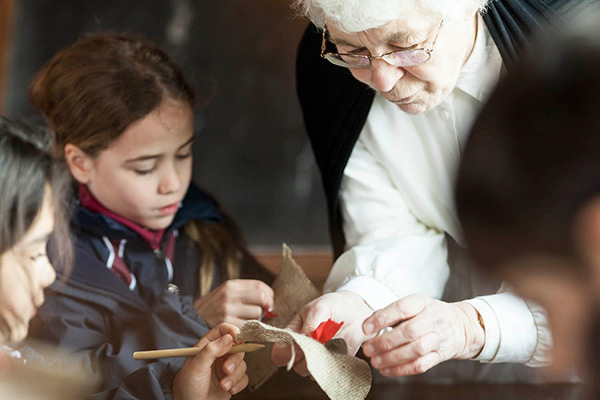 To help children to engage with these buildings we offer a variety of workshops which bring the Victorian era and ‘what happened inside these buildings’ to life. Children may cook griddle scones inside the farm labourer’s kitchen or help with a Victorian washday. They can visit the Toll House keeper’s wife or learn how she made rag rugs. Children can experience how ordinary families created a light source to use in their homes during the long, dark evenings and they can make butter inside our dairy barn in our traditional farm yard. You may wish to link with literacy and take part in our Little Red Hen theme day which is set in the 1880s or to experience a Victorian Christmas during the last two weeks of November. Many of our workshops are led by costume interpreters and we are told the children feel immersed in their experience, often remembering and re-telling aspects of their day in the weeks following their visit. Choose three 45 minute workshops of your choice or one 60 minute workshop and one other and create a whole day of immersive learning. How do we create Rag Rugs? How did we wash clothes in the past? What was it like to live in a Victorian toll house? What was it like in a Victorian School?